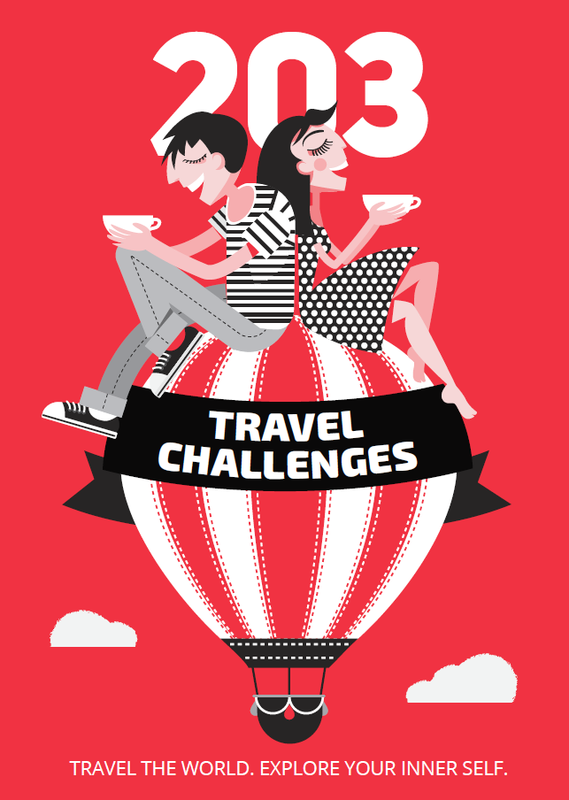 A country that sees 30 million tourists a year won’t have trouble offering you places to stay of any kind. While the specific places will depend on your itinerary, here are a few general types of accommodation you can consider sleeping in at least once on your trip to Thailand. A night in a floating bungalow will easily turn into a highlight of your trip to Thailand. 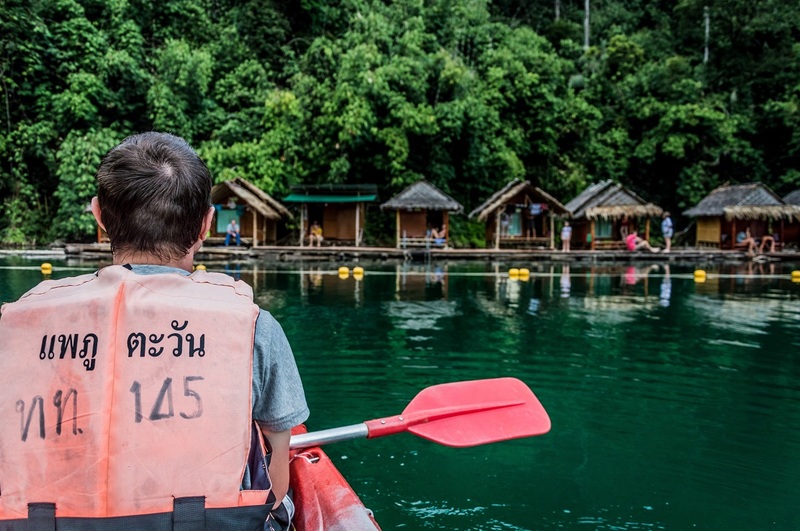 There are popular 2 day/1 night tours in Khao Sok National Park in Southern Thailand, where you’ll explore Cheow Lan Lake and sleep more than an hour by boat from the nearest shore. The bungalows are very basic: essentially just a floating box containing a mattress with a mosquito net over it. During our stay the raft house gently swayed, while the whole jungle orchestra performed a lullaby for us, including monkey calls, insect mating cries, and the roars of indistinguishable beasts. The views at sunset are magical and the night sky makes you believe it’s the first time you’ve really seen the stars. What better place to live like a monkey than in jungle-rich Thailand? 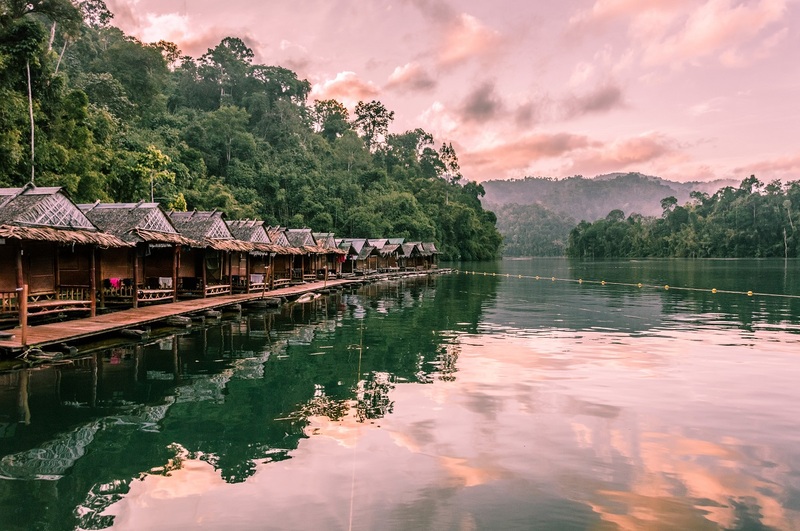 In a recent collaboration post, Alexandra Black Paulick from the Positive Impact Journey blog told the story of her stay at Pai Treehouse Resort. If you’re traveling on a budget (although you don’t really need a lot of money to travel in Thailand) and you’re struggling to find cheap flights to the far-flung destinations on your list, you’re sure to experience Thai night trains at some point. 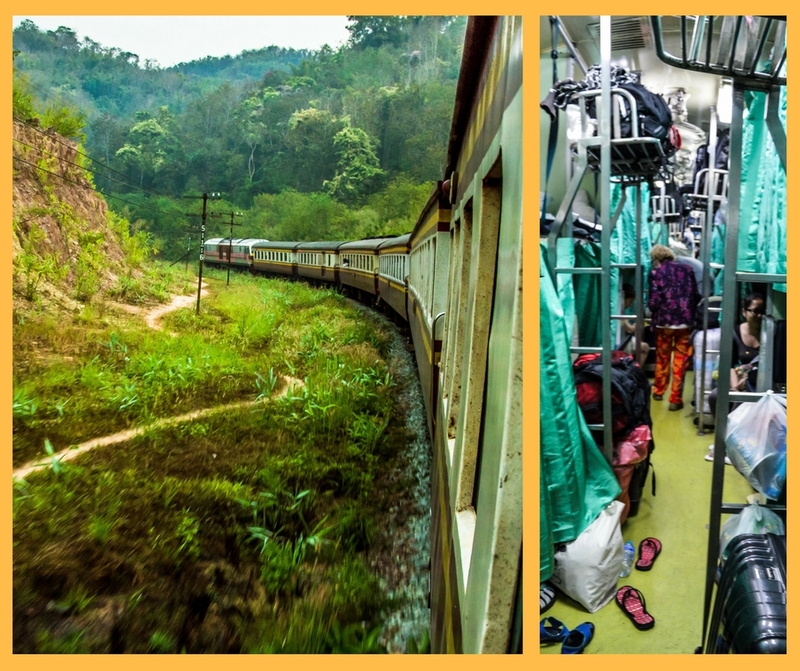 During the high season, tickets for long-haul trains on popular routes such as Bangkok – Chiang Mai and Bangkok – Suratthani sell out very fast, and you’ll have to book your seat/bunk bed a week or two in advance. The sleeping cars in Thailand come in two varieties – with AC and with fan (cheaper). The fan option was quite bearable despite all the bad reviews we had read about it (and we also met Santa Claus from Australia in that car, but that’s another story to be told some other time). When the sun sets, the attendant unfolds the seats into beds and gives you linen and pillows. When the sun rises, make sure you wake up to see the majestic light and mist show out the window. 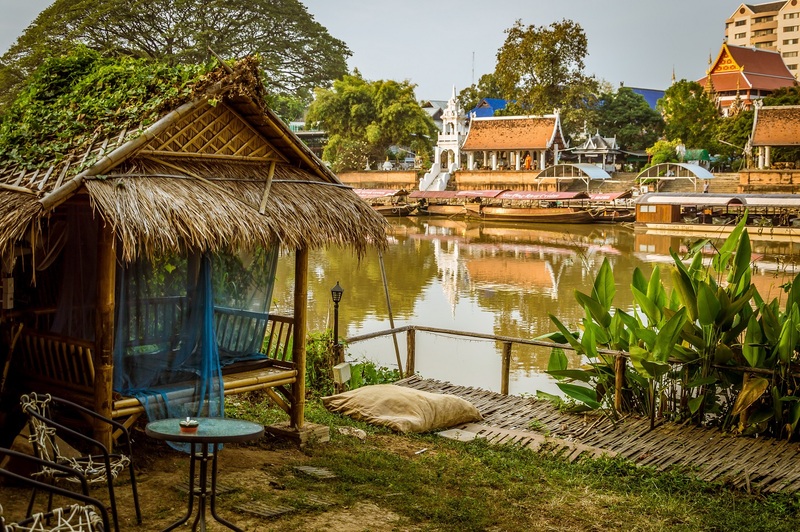 Our $3 riverside camping spot in Mapping Hostel, Chiang Mai felt so much like home that every day we woke up with the irresistible urge to stay for another night, and in the end we prolonged our stay four times. The hot weather in Thailand makes it pleasant to sleep outside at night – a mosquito net is all you need and it’s crazy cheap. 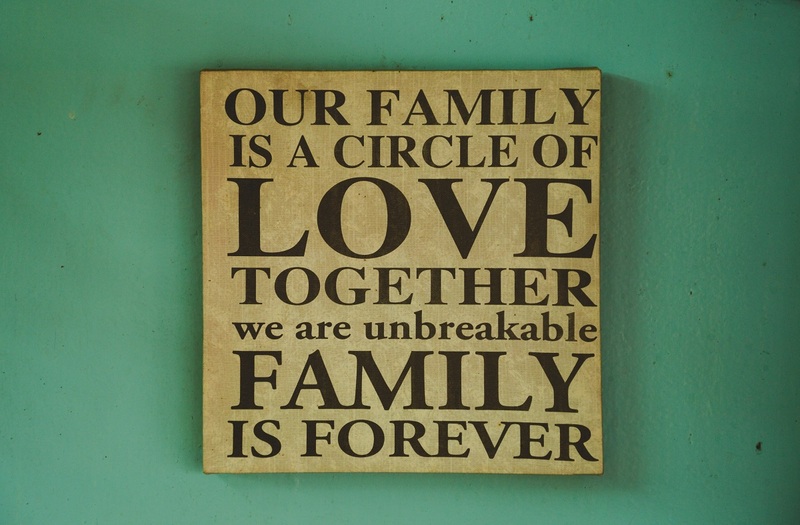 I got the impression that most hostels in Thailand are family-owned, which means that from day one you are considered a family member and treated as such. True story: Our first night in Bangkok was a nightmare with a happy ending (not that kind!). We arrived from the airport late in the evening and took a tuk-tuk, handing the address of our booked hostel (Love Hostel) to the driver. But what a sense of adventure overwhelmed me when, already at the desired address, we discovered there was no such hostel here. After 10 minutes of wandering around, we were sure this supposed hostel did not exist anywhere within a radius of 10 streets. I called the hostel’s telephone number and nobody answered. We continued searching in the hope that we’d notice a hidden tiny sign to our hostel, and in the process we accidentally entered a Buddhist monastery, which was fun but not really helpful. In my despair, I called again and this time the owner answered. After 20 minutes of discussions and zigzagging the streets, he finally found us and took us to our refuge for the night. At first, we thought he and his wife didn’t speak English, but a day later we realized they spoke English with Thai pronunciation, i.e. not pronouncing a single consonant (or so it seemed). Just try to speak this way and get the message across that there’s a leak in the upper-floor bathroom… Anyway, once we started understanding them, we also came to understand that they were constantly joking about us, themselves and everything else around. We loved these people and prolonged our stay with them by two additional days. Then, two weeks later, we had to stay another night in Bangkok and chose the same hostel. Not only did the owners give us a huge discount on the already cheap room, but they also supplied us with free bananas for our night train ride the next day. From time to time, they still send us photos of their family and cats on Facebook. With this oversized story, I’m putting an end to this post and wishing you a homey and adventurous stay in Thailand! Very interesting post! Those riverside hostels sound very nice, it’s always terrible to be cramped up inside if the fan or aircon isn’t quite up to par (been there done that). So glad you finally found your hostel in Bangkok! That is seriously one of my big concerns, that I book something in advance and it turns out to be a scam and there’s nothing there.. I love that you can find cheap amazing accommodation in Thailand. That $3 riverside hostel looks like my kind of place. I’d probably end up staying there with that same irresistible urge for way too long. I love all of these places! I didn’t even know that had budget waterfront bungalows in Thailand. Were the mosquitoes really bad by the river? Not at all! Maybe it was the season but there were almost no mosquitoes.